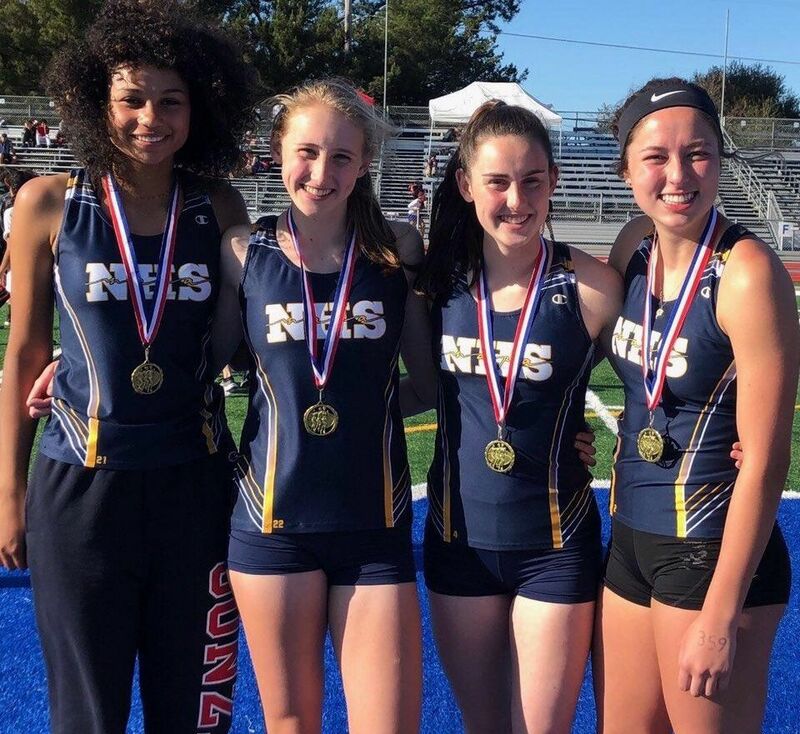 Winning the 4x400 girls relay for Napa High at Analy's Castleberry Invitational were, from left, Aliyah Aguiar, Molly McGrath, Jane McLoughlin and Caitlyn Berryhill. Napa High's Nicholas Rubio won the boys 400 meters at Analy High's Castleberry Invitational on March 30. Napa High's Joey Holland placed third in the discus at Analy's Castleberry Invitational on March 30. Napa High's Mia Oggenfuss placed second in the girls high jump at Analy's Castleberry Invitational on March 30. The Napa High track and field team had a strong meet at the Castleberry Invitational on March 30 at Analy High in Sebastopol. Winning the 4x400 girls relay were sophomore Aliyah Aguiar, junior Molly McGrath, senior Jane McLoughlin and junior Caitlyn Berryhill in 4:14.32. McLoughlin also won the 800 meters in 2:18.18, while McGrath was fifth (2:30.59); McGrath was also fourth in the 1600 (5:35.37). Napa junior Mia Oggenfuss took second in the girls high jump at 5 feet and was fourth in the 100 hurdles (PR 17.16), while Aguiar was fifth in the 100 hurdles (PR 17.17) and Berryhill was fourth in the 300 hurdles (PR 50.27). Paty Rubio led the Napa girls in the throws, the junior notching sevenths in the shot put (26-6) and discus (74-10). Other top 10 finishers were junior Amany Hilliard with a sixth in the 200 meters (27.88) and a seventh in the 100 meters (13.48). In the girls long jump, Aguiar was third (15-10) and Berryhill fifth (15-0). In the triple jump, Berryhill took fourth (PR 31-6.5) and Oggenfuss was fifth (31-4.75). For the boys, junior Nicholas Rubio won the boys 400 meters in a personal-record 52.66 seconds, and was fourth in the 200 meters in a PR of 24.37; junior Erik Cosca was fourth in the 3200 (10:32.71) and eighth in the 1600 (PR 4:48.14), senior Owen Zuidema was fifth in the 300 hurdles (PR 44.62); and junior Matthew Helms was ninth in the 800 (PR 2:12.68). The boys throwers were led in the shot put by junior Quentin Dervin with a second-place finish (42-11) and senior Joey Holland with a sixth (PR 38-4), and by Holland in the discus with a third (106-6). Napa hosts Vintage at 3:30 p.m. today, in the first Big Game meet with Vine Valley Athletic League ramifications. Strong team efforts were on display from both schools as the Justin Siena girls won 87-48 and the visiting American Canyon boys prevailed 78-58 in VVAL action at Dodd Stadium. The Braves’ girls won every sprint up through the 800 meters, and led the way in all but one field event. The 4x100 relay team of Natalie Kelly, Claire Sullivan, Sydney Thweatt and Jojo Weis set the tone with a big win in a league-leading time of 52.36. Among the strong individual performances were Weis winning the pole vault (9 feet) and 300 hurdles (51.42), Sullivan winning the 100 meters (13.66) and 100 hurdles, Gianna Troppy winning the high jump (5 feet) and discus (110-5), Bella Holman winning the long jump (14-10) and triple jump, Thweatt winning the 200 meters (28.49) and 400 meters (1:03.18), and Audrey Halloran winning the 800 meters (2:43.64). Kelly also earned strong second-place points in the 100 (13.96) and 200 (28.49), while Whitney Powers took second in the pole vault (8-0). Justin Siena junior Lauren Aubert was second and senior Emily Breneisen third in the mile. American Canyon’s Isabella Richards won the 1600 (6:20.68) and 3200 (14:08.55), while Yani Kenion was first in the shot put (29-4). In varsity boys action, American Canyon freshman Croix Stewart had a huge day, winning the 100 (11.53), 200 (23.27) and 400 (53.01), while Justin-Siena’s Landon Mispagel claimed the 110 hurdles (15.59), 300 hurdles (42.55) and long jump (19-10). Another standout winner was Justin Kyle Chang of American Canyon, who took first place (4:52.52) over runner-up Jacob Guiducci (4:57.68) of the Braves. Chang also won the 800 (2:05.14) and 3200 (10:38.56). 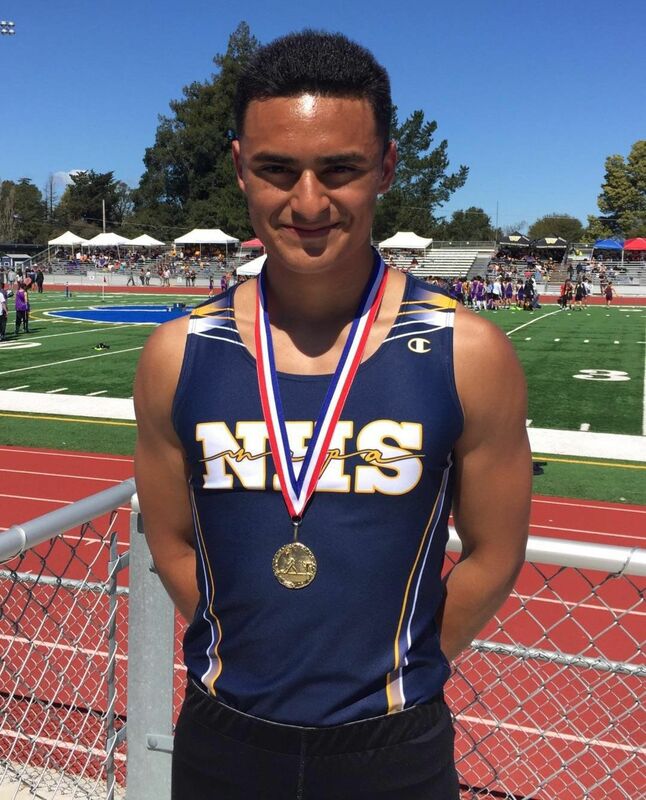 Justin-Siena’s Conrad Say was a strong second in the 100 (11.62), first in the triple jump (39-7) and second in the long jump (19-4), while Will Melancon was second in the 200 (24.64) and 400 (53.55). Liam McDevitt won the high jump, as did Casey Potrebic in the pole vault (11-0). Michael Ortega of American Canyon threw a PR to win the shot put (40-1), while teammate Eddie Byrdsong won the discus (106-4). The Braves’ 4x100 relay team of Solomone Anitoni, Blake Hoban, Mispagel and Say won in a PR time of 44.18, and the American Canyon 4x400 team of Stewart, Jazjuan Kenion, Kristian Valencia and James Santos won in a time of 3:38.57. The JV Boys saw American Canyon win 75-61 behind victories from Duran Paez (100, 200) and Ezekiel Anderson (400), while Justin-Siena got first places in the 800 and 1600 from Paul Giusto , and in the shot put and discus from TJ Schoningh. Justin-Siena’s Cole Chatagnier won the 300 hurdles, and Seth Morrison took the long jump. Diego Jimenez of American Canyon won the triple jump and teammate Trenton Angold claimed the pole vault. The Justin-Siena JV 4x100 relay team of Chatagnier, Miles Martin, Theo Lemieux and Morrison won with a strong PR time of 47.19, while the American Canyon team of Drake Hundley, Anderson, Paez and Camren Lee won the 4x400 relay in 3:55.64. Kyle Dozier shot a 71 as the Storm finished third out of seven teams in a Big 8 Conference Tournament on Monday at Windsor Golf Club. Frank Gawronski added a 79, Robby Hess and Mason Adams 82s, and Steve Plate an 84. Napa Valley finished second in another conference tournament on April 3 at Wildhorse Golf Club in Davis. Dozier and Gawronski each shot 73, Hess 74, Brandon Alemania 77, and Plate 81. The Storm were also second in a March 25 conference tournament at Chardonnay Golf Club, where Alemania led the way with a 76, followed by Gawronski (78), Plate (78), Hess (80) and Dozier (81). Napa Valley is currently third in the Big 8 standings. The visiting Braves came away with a mercy rule-shortened VVAL victory on Monday. After Justin-Siena (6-3, 1-1 VVAL) left two baserunners in the top of the first inning, Napa (2-8, 1-3 VVAL loaded the bases with two outs in the bottom half but Braves pitcher Madden Edwards got out of the jam. Justin-Siena broke through in the second, scoring two unearned runs on the second of seven Napa errors. The Braves squandered an opportunity in the third, but tallied three more runs in the fourth to chase Grizzlies starter Aiden Chatham. Gianni Natuzzi’s two-out single after a botched rundown plated two runs, and an RBI single by Keith Binz gave the visitors a 5-0 lead. Justin-Siena scored six unearned runs in the fifth without a hit, capitalizing on five walks, three Napa errors and a Natuzzi sacrifice fly. Edwards (3-0) got the win for the Braves, allowing one hit, no runs and four walks while striking out six in four innings. David Elias worked the fifth and needed only five pitches, all strikes, to end the game, thanks to two outstanding catches by Binz in center field. Along with Natuzzi’s three RBIs, the Braves were led offensively by Binz (hit, two RBIs, two walks, sacrifice bunt), Chris Duffy (hit, two runs), Daniel Kelly (hit, two runs), Braden Snoke (two runs, two walks, sacrifice bunt) and Edwards (two walks). Chatham took the loss for the Grizzlies, pitching three-plus innings and allowing three runs (one earned) on two hits, two walks and two strikeouts. Daniel Healy and Matt Patane each had a hit for Napa.